When Will My Transplanted Hair Grow & Restoration Occur? If you’re undergoing treatment for hair loss or thinning hair, you’re most likely going to have a number of questions and concerns. You’ll want to know if you’re going to find a permanent solution. You will likely ask about your recovery time and any pain that might be associated with a procedure. If that procedure is a hair transplant, a big question is going to be about the timeline for hair restoration. How long will it take for newly transplanted hair to grow and when will you see thicker hair indicating that hair restoration has occurred? RHRLI can help you if you’re looking for that permanent solution. As the only hair treatment center on Long Island that is equipped with the ARTAS® System, a robotic hair transplant procedure, we want you to know how our procedure works, and when to expect a fuller, healthier looking head of hair. According to the website, livestrong.com, the regrowth stage after a hair transplant procedure is similar to the stages of normal hair growth. This is because donor hair is taken from another location of your scalp and transplanted into the areas suffering from hair loss. Hair growth generally occurs in three stages. The active phase of hair growth is called Anagen, according to WebMD. 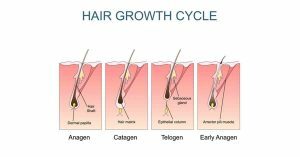 During this time, cells in the roots of the hair divide rapidly and push the hairs that have stopped growing, called club hairs, up and out of the follicle, the sac from which hair grows. The next stage, called the Catagen phase, is a transitional stage which lasts about two to three weeks. Hair growth stops at this time and the outer root sheath shrinks and attaches to the root of the hair, forming club hair. The final phase is called Telogen, which is the resting phase and usually lasts about 100 days. The hair follicle is completely at rest during this time and the club hair is completely formed. If you receive a hair transplant like the Robotic Follicular Unit Extraction (RFUE) available at RHRLI, your doctor will use robotic technology to identify the healthiest donor follicles. Then the hair will be transferred to the recipient area. What happens after that will resemble the hair growth cycle mentioned above. Transplant patients will actually experience the Telogen stage first, according to Livestrong. Patients will lose the transplanted hairs about two weeks after the procedure. But the transplanted follicles will grow hair and you should expect about a half an inch of growth per month. Every patient is different, but generally, you should start seeing new hair begin to appear in about three to five months as you enter the Anagen phase. It should take about six to nine months for you to see significant improvement in your hair and the final results should be noticeable about a year after the procedure has taken place. The growth cycle will continue like normal hair. RHRLI can provide you with a permanent solution to hair loss that is minimally invasive. Unlike techniques such as strip surgery, which can be painful, or transplant procedures involving a hand-held device, the ARTAS® system is more accurate and the recovery time is quicker. The procedure is virtually pain-free with only minor discomfort. Contact us today for a free consultation.